Luigi Cozzi's even more brain cell shredding sequel has a smidgen more plot this time out. Hercules has to obtain Zeus's seven magical thunderbolts from four renegade gods and goddesses. 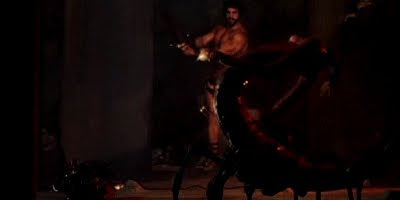 King Menos is resurrected from the dead to prevent Hercules from accomplishing his task. There's double the "special effects" in this cartoonish nonsense. You'll see a battle in outer space with Herc and Menos morphing into various animated neon creatures including a gorilla and a Tyrannosaurus Rex. A glorious cinematic joke, it's majestically awful in every sense of the word. This time, the filmmakers blatantly rip off the opening credits sequence to Superman 2, 1981. If that weren't bad enough, there's more sequences heartily cloned from Clash Of The Titans, 1981. The audience is also treated to yet another "In the beginning..." opening that riffs off of Cozzi's "original". Not quite as star studded as the first outrageous outing, Cassinelli and Berger return with the added attraction of Sonia Viviani, Margit Newton, Maria Rosaria Omaggio, Ferdinando Poggi, Venantino Venantini and Serena Grandi as Euryale. Grandi nearly upstages Ferrigno with her even more impressive physique had she revealed a bit more. Italian lunacy at its finest.